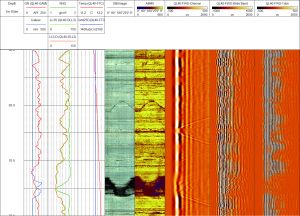 The QL40-FWS Full Waveform Sonic tool is used extensively in the groundwater, mining, and geotechnical industries. Sonic logs are widely employed, often in combination with other logs, to provide porosity, permeability, and geo-mechanical properties. This probe is ideal for cased-hole and open hole applications, such as fracture identification and cement bond logging. The QL40-FWS implements a high energy source wave generated by a ceramic-piezoelectric transducer to excite the adjacent formation. Waves of different frequencies are developed and propagated within the formation, allowing for real time analysis of the full waveform by WellCAD software. Under suitable borehole conditions, Compressional (P), Shear (S), Stoneley, and Tube wave arrivals can be detected. The FWS sonic probe must be used in a fluid filled hole and is stackable within the Quick Link (QL) product line or it can be run as a standalone tool. The tool is offered with one transmitter and 3 or 4 receivers. Weight 18 Kg 39 lbs. For more information, please refer to the WellCAD Sonic Module Data Sheet.